I looked at a few mock drafts and came up with a list of LB’s and WR’s that the Bills might be able to grab in rounds 2 or 3. This is assuming that the Bills trade up in the draft for a QB and send away their 22nd pick in the draft in order to move up. The Bills currently have two picks in both the second and third round. They might need to trade one of their second’s and third’s to move up for a QB but still should have at least one pick left in the second and third round. Rashaan Evans- Alabama- I see him slipping into the early part of round two now. This might be a pipedream that he is still around when the Bills pick or they might be able to move up to get him. A versatile playmaker at Alabama he would be a nice get for the Bills to fill Preston Brown’s departure. Malik Jefferson-Texas- projected as the best LB at the start of the season he has slipped into a second day prospect. Best suited as a pursuit LB with the ability to run free and make plays with his great athleticism. Josey Jewell-Iowa- the opposite of Jefferson is Josey Jewell a very productive LB with 136 tackles in 2017. Makes the most out of his athleticism but there is a question of how athletic he actually is. Could be a Zach Thomas type of steal. Fred Warner-BYU- the Bills brought him in for a pre-draft visit and it makes sense. Warner has moved up the draft boards from a day 3 pick to a third round day 2 guy. Moves like a safety, very versatile. Ideal fit for the Bills. Oren Burks- Vanderbilt- very smart versatile and athletic. I love this guy. Has experience calling the defensive plays for Derek Mason’s team this year. His instincts are right up there with Josey Jewell’s as off the charts good. Darius Leonard-South Carolina State- Has NFL size and dominated, as he should of against lesser competition. He came on and had a strong Senior Bowl showing ability to cover and go sideline to sideline vs the run. Shaquem Griffin-UCF- feel that he has risen to go in round 3. The great story of the kid with one hand has been one of the great storylines of the draft. One needs to be remembered his how he played last year. He was one of the best defensive players in the country. His combine showed what a great athlete he is. 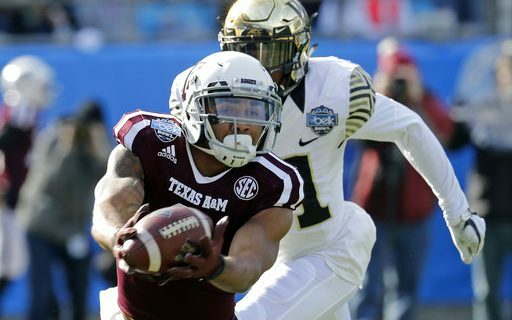 Christian Kirk-Texas A&M- plays in the slot as well as outside. Bills like players that can do both. His run after catch skills are off the charts. Cortland Sutton-SMU- has fallen recently. At one time thought as first round guy now to me more of a Laquon Treadwell taller receiver that needs his upper body strength to create separation. A very polished receiver some say like a wily veteran already. James Washington-Oklahoma State- a speedster the Bills could use on the outside. In fact many mock drafts have the Bills taking him in round 2. Averaged 19 yards a catch over the last three years with the Cowboys. DJ Chark-LSU- outstanding speed for the vertical passing game something the Bills are missing. Had a tremendous Senior Bowl and then followed up with a great combine. Offers value as a tremendous punt returner, 2 punt returns for TD’s in 2017. Anthony Miller- Memphis- smaller slot receiver that put on a show this year in many games including the Tigers early season upset of UCLA. Good size hands (10inch) at the combine for a smaller receiver. Dante Pettis- Washington- Plays very fast and I feel is a more well rounded receiver than John Ross was last year. Ross struggled as a first round pick. A little thin receiver would need to add bulk but is electrifying with ball in his hands. For more on theses players, read NFL expert Greg Gabriel’s scouting reports on linebackers, WR Miller, & WR Sutton & Washington.